Or go to the Duo Login here. Visit https://2fa.ndus.edu and click Start setup to begin enrolling your device. Select the type of device you would like to enroll and click Continue. We recommend using a smart phone for the best experience, but you can also enroll a land-line telephone, a U2F token, or an iOS/Android tablet. 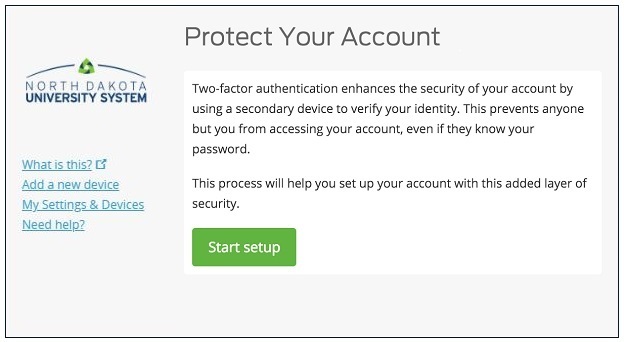 How do I configure device options for Duo Multi-Factor Authentication (MFA)? How do I get a Security Key (Yubikey)? How do I remove a device from Duo Multi-Factor Authentication (MFA)?